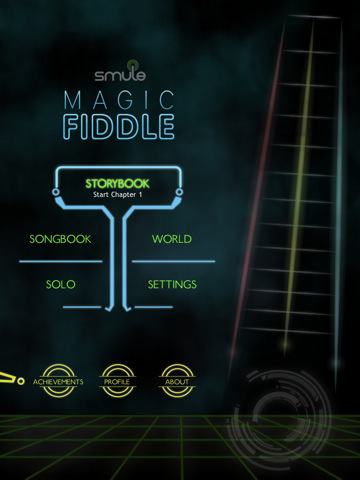 Magic Fiddle for the iPad by Smule may be the closest you’ll ever get to joining an orchestra. The app teaches people to play a magic fiddle in no time, and everything from then on out is about honing your performance. When Smule first boots up you have to sign up with a username and email, but I haven’t received any spam so I think you’re safe in that department. You start off by naming yourself and the app, and then the app starts you off with a chapter book style lesson plan. Your instrument takes on a personality of its own as he pokes fun during interactive lesson plans that teach you where to put your chin and hands, how to hold your iPad, and how to use your bow. Your instrument takes you through scales and teaches you a little bit about music history, but these kinds of information feeds don’t feel like Wikipedia at all. Instead the information is fun, a little snarky, and thoroughly enjoyable. When you’re first learning to play the Magic Fiddle it feels a little bit like your guide is telling you to do something that’s going to make you look really ridiculous, but that kind of absurdity is part of what makes the instrument fun. I was grinning from ear to ear through the whole tutorial, and the learning curve isn’t so steep that you can’t play Mary Had a Little Lamb (somewhat pathetically) after the first couple minutes. 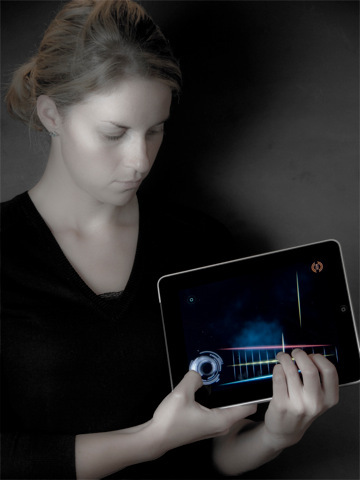 All you have to do is rest the iPad on your left shoulder, hold the bow in the right spot to control your sound, and then use your left hand to pluck away at the three strings as flying indicators hit them in time to play the music. Once you’ve completed the tutorials (or even before if you want), you can head over to the main menu and choose to play your own songs from the songbook, compose your own music in solo mode, change your settings, and see what other people are playing throughout the world. 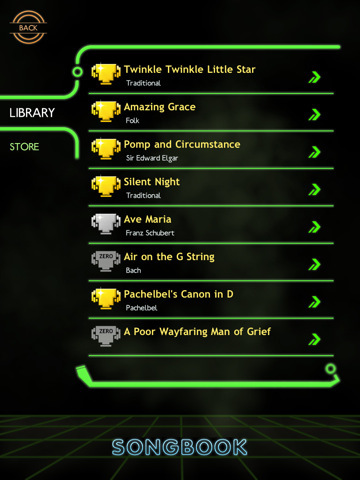 Songs in the Magic Fiddle’s arsenal include (but aren’t limited to) Wagner’s Wedding March, Minuet in G, Ave Maria, the Mario Theme, In the Hall of the Mountain King, Silent Night, Amazing Grace, Auld Lange Syne, Twinkle Twinkle Little Star, and Brahms’ Lullaby (labeled with “not easy”). 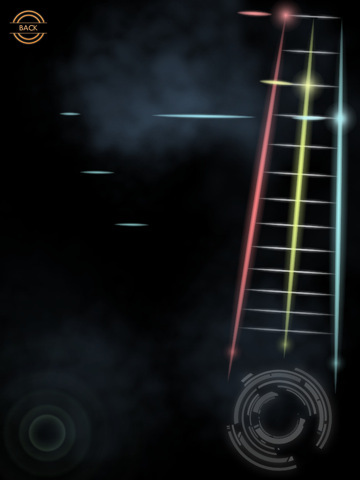 After you complete each song you receive points, ratings and medals much like guitar hero, except the overall sound and song selection means that this game is clearly for the more sophisticated set. After each song you sum up your experience in a single word. Although when you start the words will probably end up in the realm of “chaotic,” with a bit of practice you’ll start to see yourself producing masterpieces. Bottom Line: Magic Fiddle for iPad is a fun and snarky musical instrument app that lets you play everything from Ave Maria to Pomp and Circumstance and share your music with the world.